PLEASE NOTE: To speed up bar queues this year, we’ll be using CASHLESS BARS. There are ATM’s at various locations on site. These transactions are subject to banking surcharges. The bars and some food vendors will have eftpos/pay pass facilities. There are no cloakroom facilities for this event, so a reminder – what you bring, you have to carry – so pack wisely. There are lockers available you can hire which also contain phone charging facilities. Electric Gardens is fully wheelchair accessible and we endeavour to provide the best festival experience possible. The main toilet block areas at this event all include disabled access toilets. A drop off area is located on Parkes Drive near the Café, please note that no vehicles can enter the Parklands after 20:00 to do pick-ups, this includes Taxis. First Aid medical tents are located on site for the duration of the event. Electric Gardens accepts the NSW Companion Card. The amazing team from Red Cross save-a-mate will be part of Electric Gardens to assist in patron comfort, offering harm reduction and peer support services. The Red Cross save-a-mate (SAM) program provides health promotion messaging and support at music festivals. The “SAM Crew” attend festivals with the aim of reducing incidence and AOD (Alcohol & Other Drug) related harms amongst event patrons. This is achieved through the promotion of safe behaviours as well as by identifying and supporting individuals within the “Chill Out Space” who may be experiencing physical or psychological signs of overdose. Please remember this is the middle of summer – make sure to wear a hat, apply sunscreen and dress appropriately for the conditions on the day. Free sun cream will be available from the First Aid & Red Cross tents if you need to top up. Water is available at several free drinking stations located within the festival grounds as well as free chilled water at the Red Cross save-a-mate Chill Out Space. Check the festival map for these locations. Shaded chill out zones can be found throughout the site. See festival map for these locations. No chairs, tables, BBQs, eskies or anything of this nature are permitted to be brought into this Event. No alcohol or food can be brought into this Event. Glass bottles or cans are not permitted regardless of their contents. Food, alcohol and drinks are available for purchase inside the event. Water is available at two free drinking stations located within the festival grounds. Public Transport is the best way to arrive at Electric Gardens. Please call the public transport info line on 131 500 or visit www.131500.com.au for more info. A dedicated drop off area will be set up for Taxis and other drop off vehicles. It is located on Parkes Drive, near the Café, until the park closes for vehicles at 20:00. Please Note: No pick-ups via private vehicle, taxis, or Uber will be available after the event, please catch the free shuttle bus to Bondi Junction. The hours of operation will be released closer to Event Day. Centennial Park pick up location is Grand Drive near the Café. Bondi Junction drop of location will be the train Station. Lost property location will be at the Lock-it-Up lockers. Any lost property handed in to, or found by the organisers will be logged and stored for collection for a period thirty (30) days. Debit and Credit cards will be held for 7 days after which, if we have had no contact from the owner, they will be destroyed. Should you be enquiring about lost property after the event, please email info@electricgardens.com.au, clearly marking Lost Property as the subject. On site enquiries at the Event can be made at the Lock-it-Up lockers tent. Please note that post event email enquiries regarding lost property will not receive a response until at least a week after the show as we will still be on site completing the event pack down. In cases where found items have clear contact details, we will attempt to contact the owner. All email enquiries should include a full and clear description of the item in question, including size and colour, branding, make and model where applicable and any other distinguishing features that can help us identify the item. It may be necessary for us to request specific information regarding the item for identification purposes. This may include description of contents for bags, purses and wallets, engravings and distinguishing marks on jewellery and in the case of passports, I.D. cards and licenses we may require unique identification numbers such as birth dates, addresses etc. Once ownership is established it is up to the owner to pay all and any applicable postal charges in order to retrieve their item. This may be providing a stamped self-addressed envelope of an appropriate size and cost for the item, or a courier to pick the item up. Items can be collected in person at an arranged location. All unclaimed item will be disposed of and all personal data removed and securely destroyed. If you are foolish enough to buy elsewhere you may well be buying a forged or stolen ticket. This is solely at your own risk and may result in refusal of entry. We bear no responsibility for that as you have been warned. If you have any doubts regarding ticketing, please contact the organisers. If for any reason that a site evacuation is required, the Event will not continue on that day. Evacuation will be at the discretion of Emergency Services, Centennial Parklands Trust and/or the Event Organisers. Free earplugs are available from First Aid and Save-A-Mate tents at the Event. Sound levels at outdoor events like those at Centennial Park can vary due to number of factors including EPA restrictions and wind conditions, so be aware that it differs to an indoor event. Sydney weather can be unpredictable. Please keep an eye on the weather forecast for Electric Gardens and if rain is likely please bring suitable wet weather clothing, or brave the elements as you wish. Umbrellas are not permitted for safety reasons. We do have enclosed tent areas on site but these can only accommodate a percentage of the crowd at any one time. If Sydney is expecting a VERY hot event day, please prepare accordingly. We will do our best to make the day as comfortable as possible but there is only so much one can do so make sure to wear a hat, apply sunscreen and dress appropriately for the conditions on the day. Remember Centennial Parklands belongs to us all, please respect and take care of her. Bring only what you need for the day and look after your belongings and each other and enjoy your day at Electric Gardens. 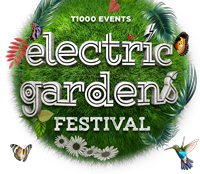 If you have any other questions please drop us an email on info@electricgardens.com.au (Remember the closer it gets to event day the busier we are, we will do our best to get back to you ASAP).